Zoe has a couple of fun new games. One of her favorite is "chase the snow." You know how you kick up little balls of snow when you walk and they roll along the snow in front of you? Well, she thinks the snow is running away from her. 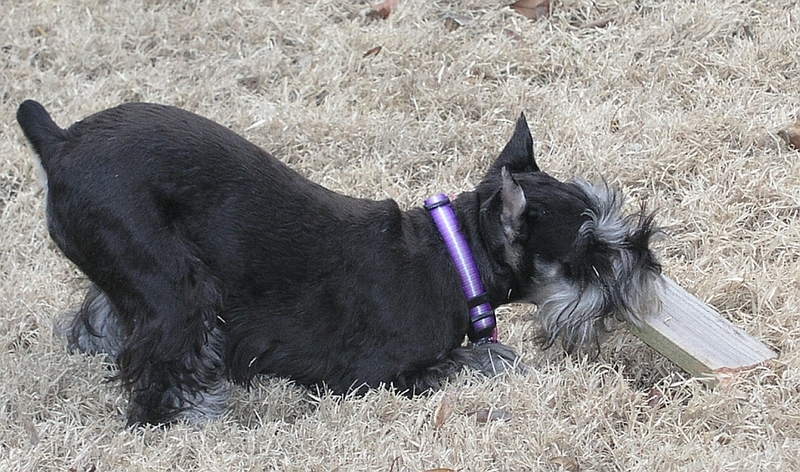 So she pounces on it and bites it, which kicks up more little balls of snow. 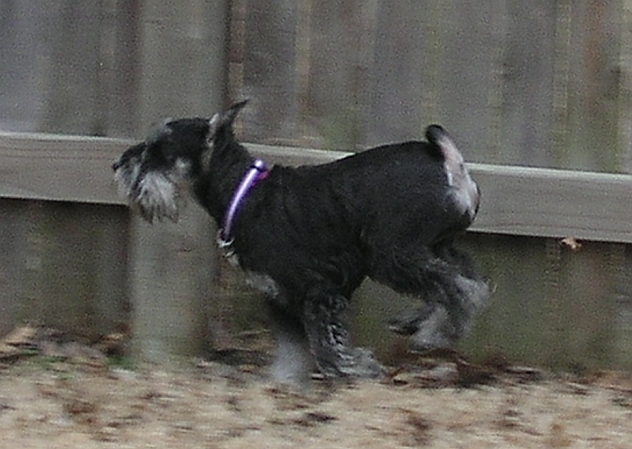 She pounces again, snapping at the snow that is running away. We've gone all the way across the yard like this, which takes a lot of time and makes her forget WHY we are outside to begin with. Her second favorite game is "watch the toilet." She is just big enough to stand up with her feet on the edge of the toilet seat and if she stands on tip toes, she can see inside the toilet bowl. She is completely fascinated by the swirling water and she just can't figure out where it goes. She is cutting teeth and chews on everything. I think her company name is "I Chew Anything, Inc." I bought nyla bones, which was a VERY smart move on my part. She chews them for hours, which keeps her from chewing on other things she shouldn't be chewing, like furniture, for example. She's a high tech chewing machine with jaws of steel. "No, Zoe" is becoming one of the main phrases coming out of my mouth lately. She's just a puppy and she's learning. The whole world is new and exciting. I'm getting to discover the world again with her, which is fun and often funny. She's a pint-sized little puppy and she has stolen my heart! I have been accused of having a twisted sense of humor. Some say it is too dry. Some say it's too quirky. Some say I'm totally crazy. I'm probably all three and worse, but this tickled my funny bone, so I have to share it with you all. Make sure the person who is annoying you and intruding in your personal space can see the screen. Close your eyes and tilt your head up to the sky. It's time for a Zoe update! 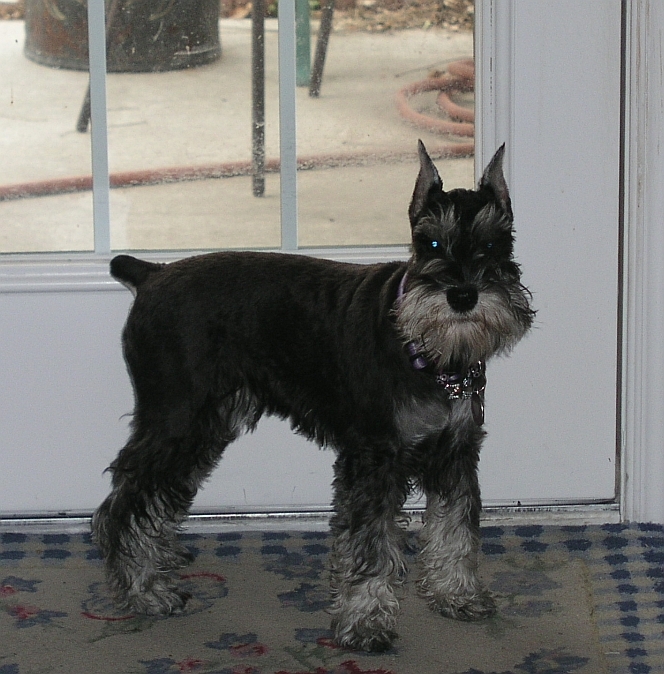 First, I stand at the door and look pitiful until Mom caves and lets me out...again...tee he! Then, it's RUN, RUN AS FAST AS I CAN!!!! 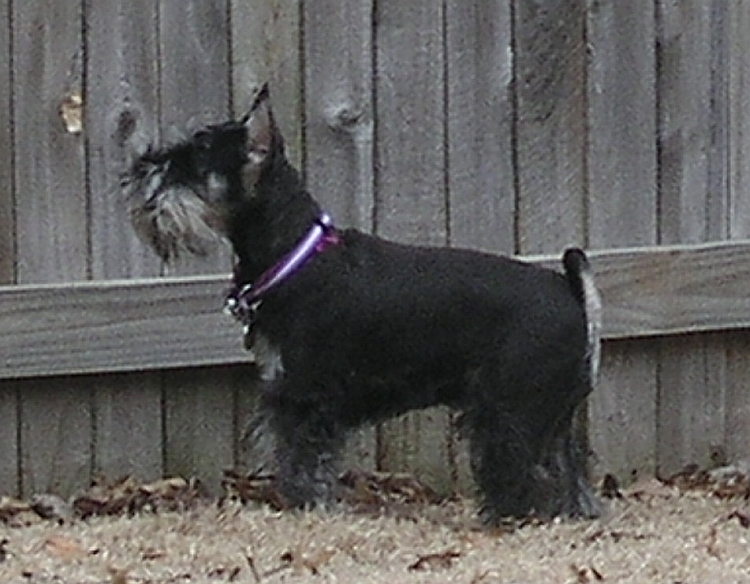 I like to run up and down the fence a few times because I'm a wild puppy with lots of energy to burn!! When I find a good knothole, I stop to visit (whine and sniff). Once I get tired of that game, there are so many things to play with, I can hardly contain my excitement!!!! I'm having so much fun here!!!! I know I never talk about Zoe, so I'm sure you are all waiting to hear more about her...since I never mention her or anything. I've been remiss; truly I have. And I feel terrible about it. I'll try to do better in the future. I promise. 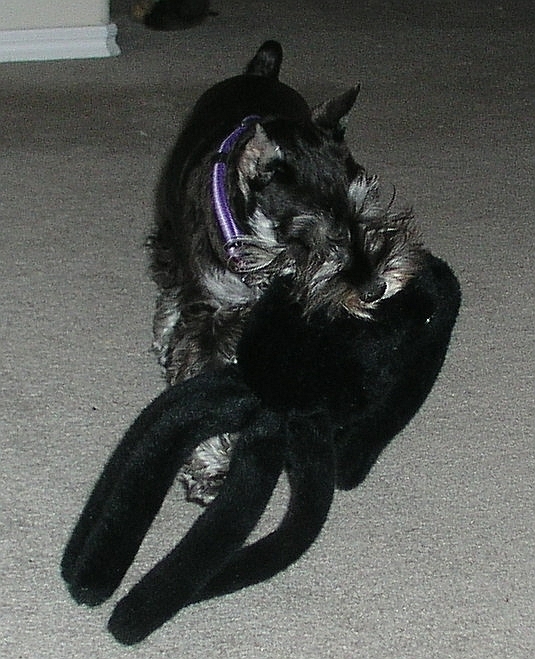 One of Maddie's favorite toys was a spider that was supposedly made for a large dog. She would play with it and shake the stuffing out of it, legs flying everywhere. Then she would chew it and sometimes she would sleep with her head on it. Hers was getting pretty worn out, so I bought a new one for her, but she died before she got to use it. So I thought I would give it to Zoe and see what she thought about it. It's bigger than she is, but she loves it. We play tug with it (she can't tug very hard just yet - still getting her big girl teeth) and I make it attack while she attacks back. Then I'll throw it and she will run to retrieve it. Maddie would never give something back after you threw it. She wanted to be chased. But Zoe brings it back and drops it right in front of me so we can play some more. We wrestle, then I'll throw it again and she'll go after it like a shot, bringing it back to me so we can keep having fun. I'm enjoying that. I used to get dizzy chasing Maddie around in circles in the living room. But I think it's cute that Maddie's favorite toy has also become Zoe's favorite toy...even though they play with it differently. 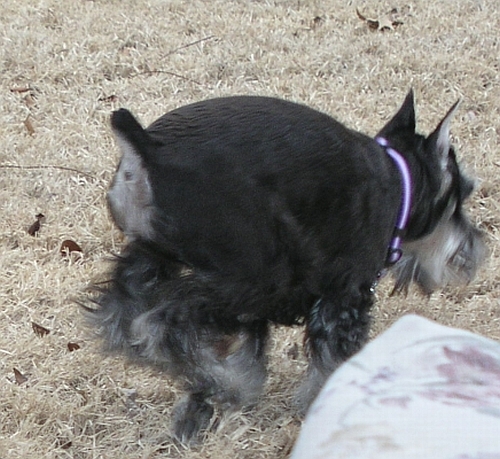 Zoe also likes to chew on it and shake it wildly so the legs are flying in all directions! Here's a picture of Zoe with her spider. She's bringing it back to me for some more raucous fun! Tomorrow is Zoe's big day. She is going to be spayed and I'm nervous and anxious for her. I never like it when they have to anesthetize her. And I know she isn't going to be feeling very well for a few days. I'll be glad when it's over and she is back home with me again. Last night, she was feeling a need to be especially close. I was working on the computer and she just would not leave me alone. 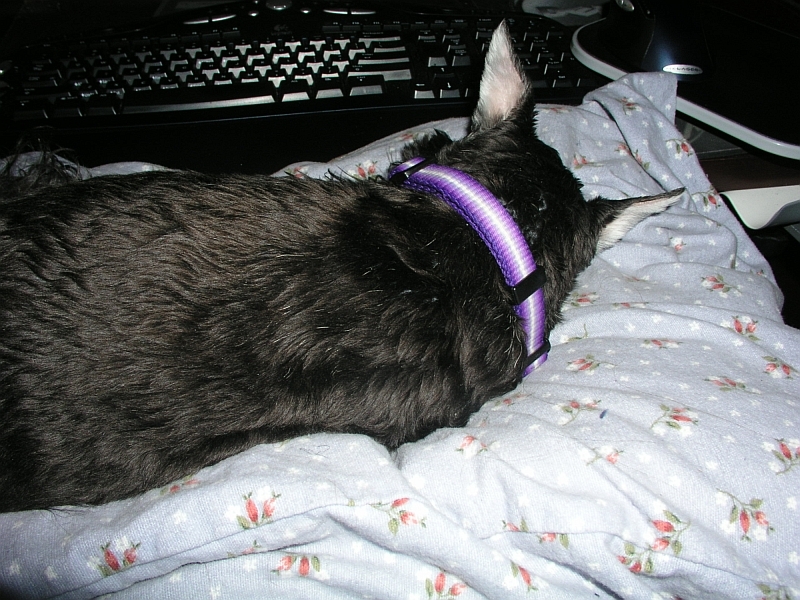 I finally got a pillow, put it on my lap and then put her on the pillow. She was totally content. 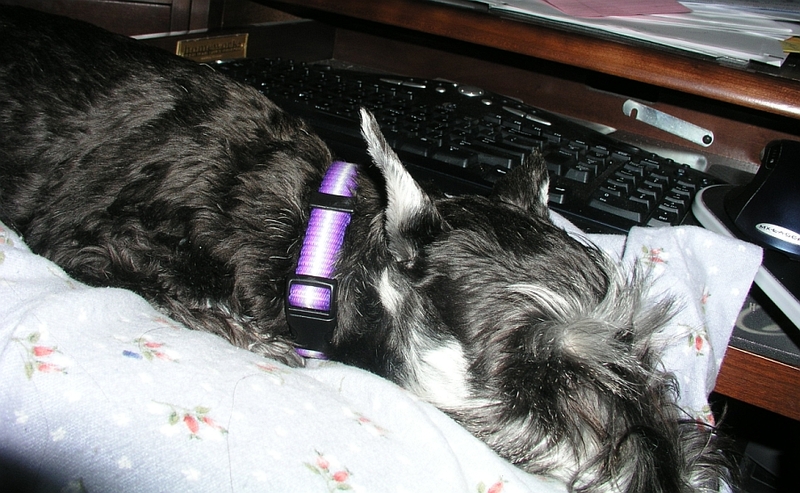 Not very ergonomically correct, but I didn't have the heart to push her away. And no, she is NOT spoiled!!! 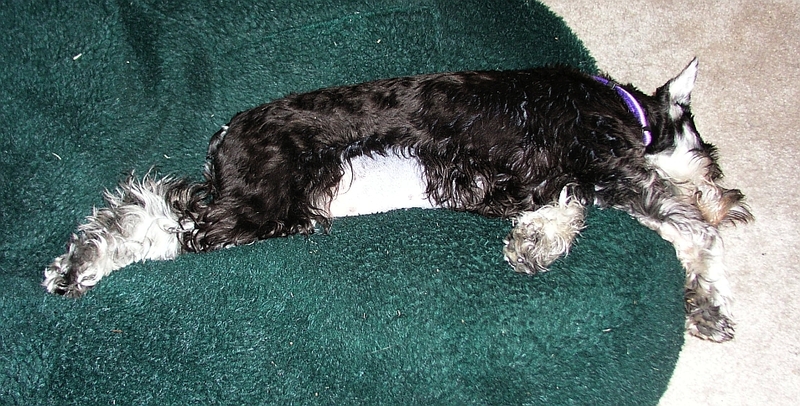 Zoe was spayed yesterday. There were no complications other than me feeling like an awful person because she was hurting so much! But she is much improved today, so I'm feeling better too. Yesterday was actually "Spay Day USA - 2007." I didn't realize that when I scheduled her surgery and the vet didn't mention it to me either. But I thought that was kind of cool that she was spayed on a special day. Her little tummy is totally shaved and I can't give her tummy rubs right now, which I gather, is kind of like giving catnip to a cat. It's pure ecstasy! I'll be glad when she's healed enough that I can give her tummy some loving. 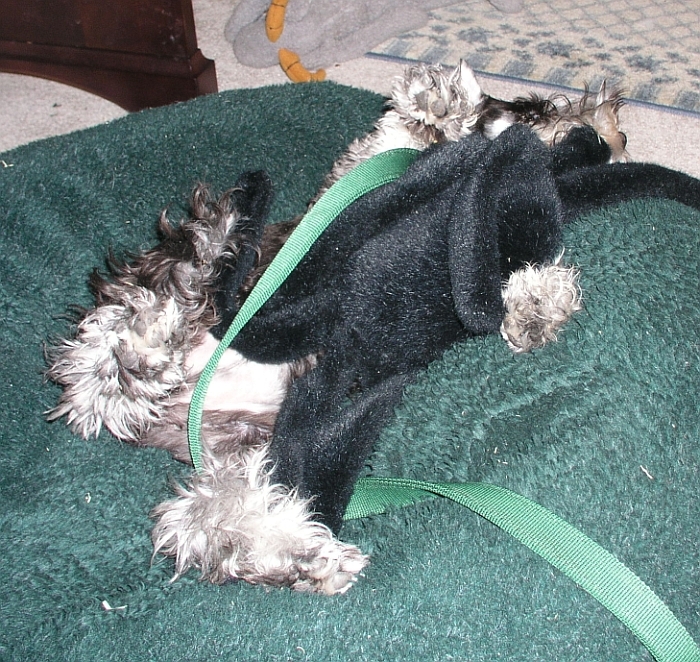 Here she is, convalescing. Look at that poor little white belly!